Bubba Watson blamed his two-day score of six over on the fans and the lack of security at the French Open. 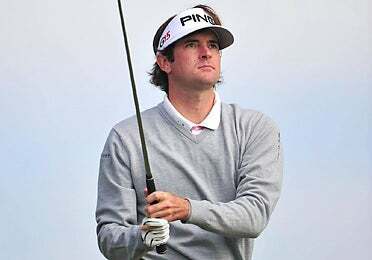 SAINT-QUENTIN-EN-YVELINES, France (AP) — American golfer Bubba Watson missed the cut Friday at the French Open, suggesting fan behavior and poor security contributed to his disappointing performance. Watson shot a 3-over 74 in the second round for a 6-over 148 total on the Albatross course. "It's not a normal tournament," Watson said. "There's cameras, there's phones, there's everything. There's no security. I don't know which holes to walk through. There's no ropes." Watson has won two titles this year but rarely plays in Europe. He was apparently affected by the permissive culture in France that allows spectators to snap photos and record videos during play. "I'm not used to that," Watson said. "I'm not saying it's bad. It's just something I'm not used to, I'm not comfortable with. It's very strange to me. Just very uncomfortable." The American lefty complained that the rules were not respected by the fans. "Every tee says 'no phones, no video cameras' and on every tee there's hundreds," Watson said. Tournament director David Probyn was disappointed for Watson but hopes that he will come back, saying the player would be welcome. "It's a shame Bubba has felt that way," Probyn said. "I'm absolutely sure that other players have been put off by it ... but I haven't had any other complaint this week." Probyn disagreed with Watson's comments on security issues. However, he acknowledged the culture on the European Tour was different from its American counterpart. "Every fairway is roped. We've got marshals on every hole," Probyn said. "It's probably true to say that we do not use professional security in the same way as they do on the PGA Tour." He also said the European Tour was trying to adapt to spectators using mobile phones and other gadgets on a daily basis. "It's kind of reality wherever you go," he added. "It is then about educating people. How to use them and where to use them, and that's something that you'll see changing over the short to middle term." Watson said he came to Europe to experience a new culture. "The reason to come over here was just to experience it," Watson said this week before the start of the tournament. "I've played on the U.S. Tour the whole time and just wanted to come over here, just to experience a different culture, a different life, a different golf, a different atmosphere." But soon Watson felt homesick after carding a 3-over 74 in the first round. "I miss my home," Watson said Thursday. Some of the most famous landmarks in the world, apparently didn't stick with him after touring Paris on Tuesday. "I don't know the names of all the things, the big tower, Eiffel Tower, an arch (Arc de Triomphe), whatever I rode around in a circle," he said. "And then what's that - it starts with an 'L' - Louvre, something like that. One of those." After saying it might be his last time playing in Europe, Watson said he would play the British Open in two weeks. He wasn't sure if he would fulfill his commitment to play the Scandinavian Masters in Sweden. "I'll play the British Open because it's a major, that's the only reason," Watson said. "I'm going to go sightseeing real quick and then probably sightsee tomorrow (and) get home as fast as possible."